Final destination last Friday: Bergen, Norway. We bid adieu to MS Nordlys and our lovely co-passengers. We had the pleasure of meeting such interesting people, that really added to our enjoyment of the trip. Really fantastic honeymoon for us, even five years delayed. 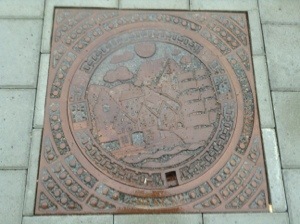 Rain in Bergen, as usual. Due to flight times Bergen-Amsterdam-Rome, we spent a night in Bergen, at Klosterhagen Hotel. How can you not appreciate a hotel which has a wafflemaker on standby for guests? Super breakfast buffet too, with homemade crispbread and farm produce. Finally home in Rome late Saturday, both battling colds, and exhausted. After two weeks of Norwegian food (fish, smoked fish, pickled herring, excellent potatoes, root vegetables, what did we fancy for our just-in-from-airport food? 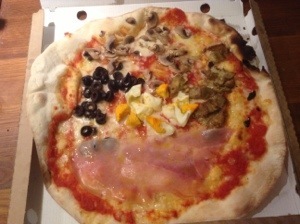 Roman pizza of course, from the restaurant downstairs. Sheer bliss. 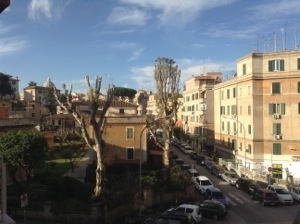 Then we woke up Sunday morning to this glorious sunny Roman morning. Wonderful holiday, good to be home! I will write some practical notes on our trip later this week, once I have caught up again here. Oh, and I had to unpack all the Norwegian food, bought on a rainy dash in Bergen. Sursild: pickled herring (with onions, tomato and sour cream). Four kinds of kaviar, and an interesting local cheese with ramsløk (wild garlic, possibly?). Plus some flour, some surkål, a little lefse, mackerel in tomato (for sandwiches), fiskeboller (fishballs), a tin of cod roe (“Enjoy cold or fried”, the tin says…. 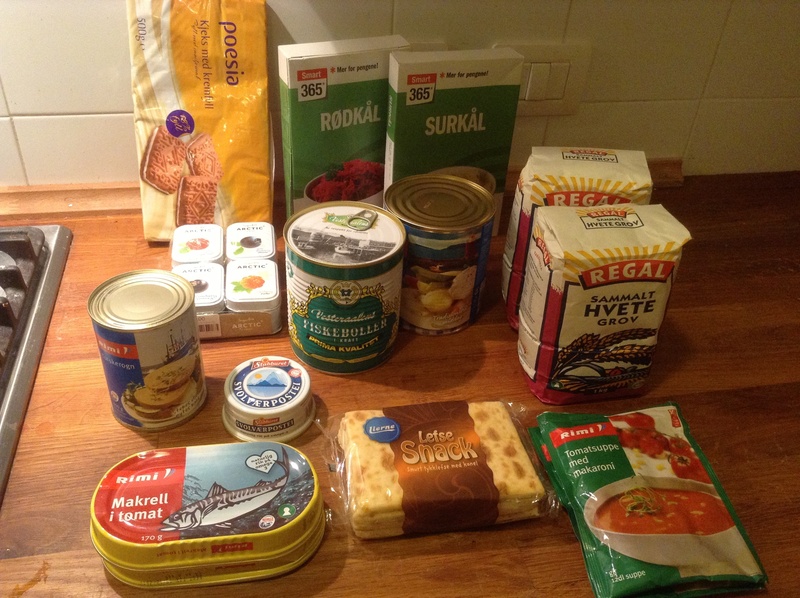 ), cod roe pate, biscuits we dragged to Kirkenes and back, and finally, tomato soup with macaroni. That soup is a nostalgia thing (and macaroni is not a pasta you find in Rome.) No squeezy cheese purchased this time. I just fancy fresh vegetables now, and was SO happy to go past our fruttivendolo (veg shop) and stock up on knobbly Sicilian bellpeppers, shiny melanzane (eggplant), spiky pale green zucchini and more. Spring is definitely imminent. 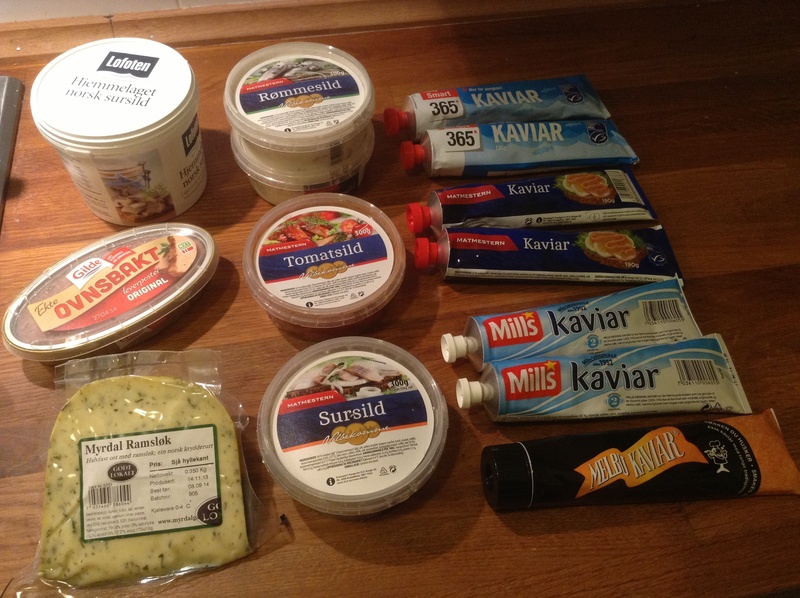 This entry was posted in travel and tagged food shopping, Hurtigruten, Norway on February 26, 2014 by krumkaker. Day ten already of our trip along the Norwegian coast! Morning light, somewhere after Ørnes and before a late breakfast. 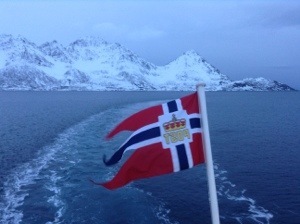 Soon after this, we met the southbound Hurtigrute ship MS Nordnorge, whose passengers waved at us and we waved back. There is a schedule printed for us every day, meals and port stops, key sites and mountains we pass and when we meet other Hurtigruten ships, it is really useful. As roundtrip passengers there was was also a 130 page book in our cabin, with maps and descriptions of birds and fishing industry and history, very useful. 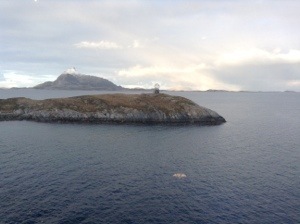 We knew from the schedule that at 0920 or so we would pass the Arctic Circle on our way south again. That is the marker, the globe on the rock. There was a ceremony on deck soon after (involving cod liver oil this time, it was ice water on your neck on the way up), both of which we passed on. But they gave us the diploma for crossing the Arctic Circle anyway, which was nice. Before university, I spent a few months working up here on an agricultural research station, but had never been back. It is incredibly gorgeous, this coast. On the northbound trip we passed this during the night, so coming through this stretch (Nesna, Sandnessjøen, Brønnøysund) in daylight on the southbound trip was fantastic. 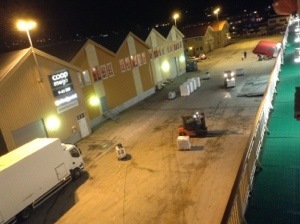 Here we are in Rørvik, after dinner, waiting for the northbound Hurtigrute MS Vesterålen. Passengers take a stroll, some get off, the little forklift trucks zip around the dock loading and unloading pallets: fish, flour, windows, every port is different. We are hoping for more northern lights as well. A little late, but here comes MS Vesterålen. 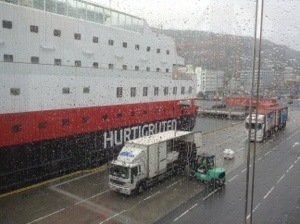 Aha, it is actually MS Trollfjord, one of the newer and bigger Hurtigruten ships. It is a deck taller than our ship, MS Nordlys, and we passengers wave at each other. 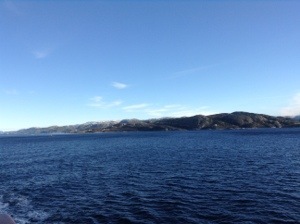 Along the coast after Trondheim. 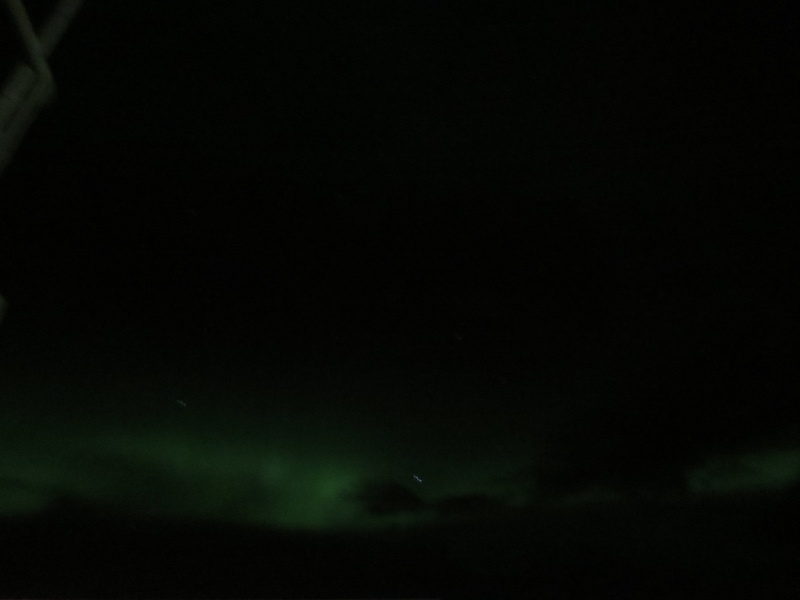 Apparently there were more northern lights last night, at eleven and at one. You can select to have northern lights announced over the speaker system in your cabin, if the bridge sees them, but I opted for sleep. (I have been battling a brutal cold for a few days, and was a bit reduced.) Still, nice to hear about it over breakfast from those who stayed up. Lovely sunny day along the coast of Trøndelag. 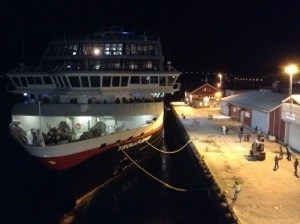 A number of passengers disembarked in Trondheim this morning, and we will reach Kristiansund soon, then Molde tonight. I am much better, and having a quiet afternoon on the promenade deck, enjoying tea and views of snow-dusted mountains. Tonight is our last night on the ship, and we are really enjoying the trip. It is clouding over, we might have rain in Bergen tomorrow? 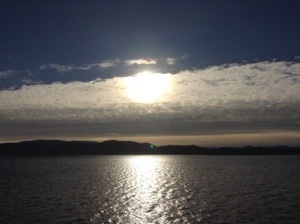 This entry was posted in travel and tagged Hurtigruten, Norway on February 20, 2014 by krumkaker. 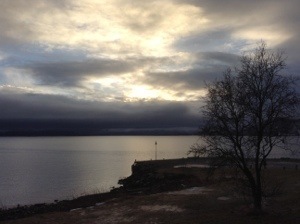 Morning light, on our way to Hammerfest. 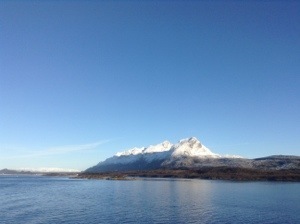 We have had very calm weather through the trip along the Norwegian coast. 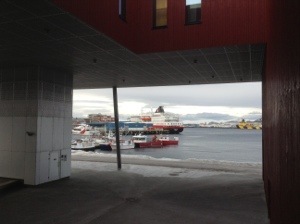 Hammerfest harbour. We wandered over to see the cultural centre. Afterwards we found a bookstore and stocked up, we have electronic books with us but I do prefer paper. My husband is reading Nemesis by Jo Nesbø, and bought the original version of the book, to try reading some of it in Norwegian. I found a Camilla Läckberg book I had not read, excellent Swedish author. 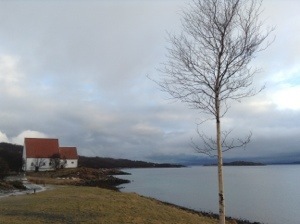 Trondenes church, a medieval church. We were on an excursion for the morning to see a bit of Vesterålen, so we left the boat in Harstad and rejoined it in Sortland a few hours later. 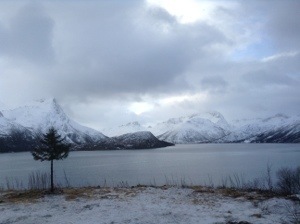 There was quite a snowstorm as we crossed the island (Hinnøya) by bus, but it soon cleared up. Finally! 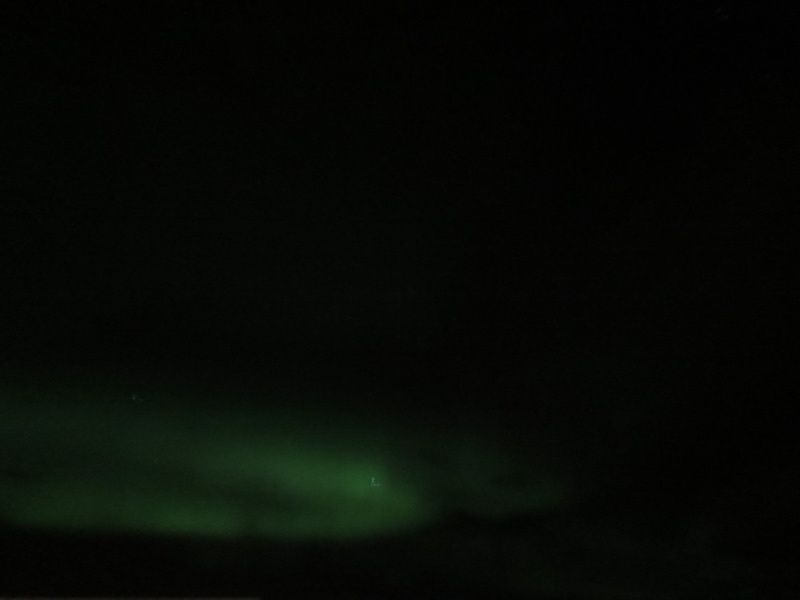 Northern lights, near Stamsund! Not very bright, but band of green across the night sky. We had been hoping for this the entire trip, and we were heading down for dinner when someone said “Northern lights!” And we all ran out to see, despite not having coats with us. Nobody wanted to miss it. Eventually the cold drove us in, but the lights came back several times last night, and we were all so pleased! With the moon being so bright and a bit of snow last night, it was not the brightest of northern light displays, but after hoping night after night to see them, it was very exciting. This has been a fabulous trip. Two more days, then we are back in Bergen. 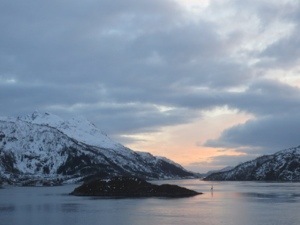 Tomorrow we cross the Arctic Circle on our way south again. 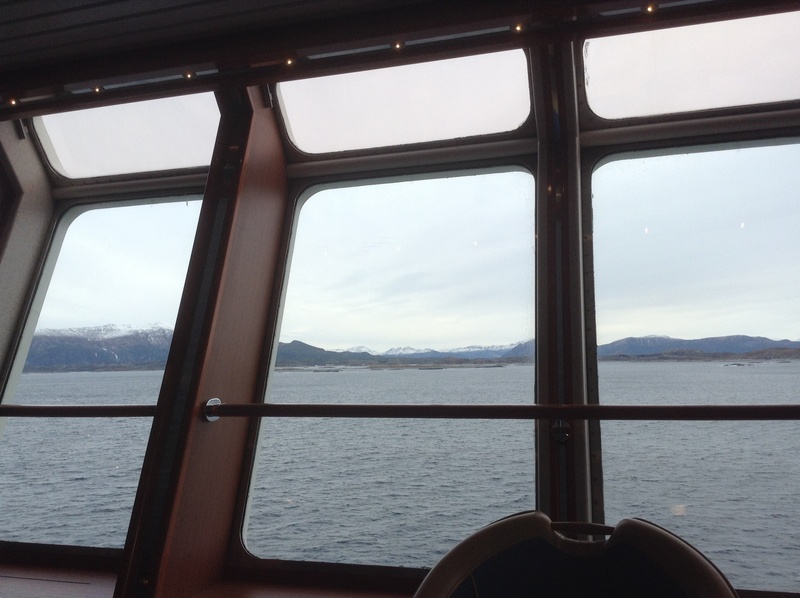 This entry was posted in travel and tagged Hurtigruten, Norway on February 19, 2014 by krumkaker.